The Animal Train Sort & Match is a charming puzzle game that teaches color and shape-matching along with pattern recognition. 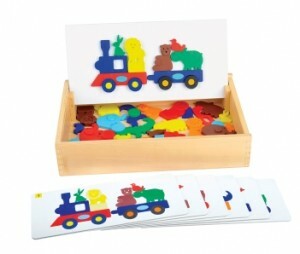 There are six double-sided pattern cards and 43 animal and train pices for endless fun. If your student has mastered basic cube design patterns, this is an ideal next step for learning to follow patterns and create different shapes. Save 15% this week only on the Animal Train Sort & Match by entering the Promo Code BLOGATSM at checkout. *Offer expires on November 1, 2011 at 11:59 pm EST. Not compatible with any other offer. Be sure there are no spaces after the Promo Code when you enter it at checkout. Written by: Different Roads to Learning on October 25, 2011.on October 16, 2018. This entry was posted in Difflearn Promo Code, Pick of the Week, Products, Sale by Different Roads to Learning. Bookmark the permalink.